It is with great love and a tender heart, that I pass on to you the news that our dear friend, sister, and spiritual mentor, Joan Ruvinsky, passed on at 12:30 pm on March 21st, at her home in Montreal. 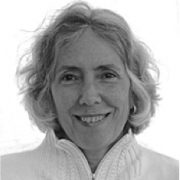 I met Joan in the mid-eighties, while she and I were attending Jean Klein’s retreats. We shared innumerable conversations over the years, as we explored Jean’s teachings on what Joan would come to refer to as the “Pathless Path”. 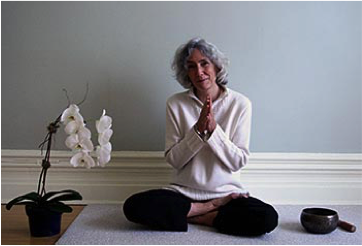 Jean’s teachings enabled Joan, in her words, to “eliminate the need to be a student, to have a path, a method or a goal.” With Jean she came home to the nondual wisdom teachings, and in turn, began offering gatherings, classes in body and breath sensing, and retreats. I was deeply touched by the simplicity, and exquisite beauty of who and what Joan offered to all of us who knew her. In this vein, I would like to share reflections that have touched my heart, which others have shared as they came to know of Joan’s passing. Joan was surrounded by flowers and wrapped in white. Her face was radiant: A beautiful smile, filled with Awe. A sight that I will never forget, that fills me with great light and comfort. I am noticing immense gratitude…for embodiment, for this life adventure, for the teachings, and immense and continued gratitude for Joan who brought these teachings to heart and light. I will miss Joan’s smile, wit and simple elegance. But I take great solace in knowing that her presence now grows infinitely bright as we each inhale her every atom into our own beingness. Joan is always with us! A memorial service will be held on Sunday, April 10 at 3:00PM at the Unitarian Church in Montreal, 5035 Boulevard de Maisonneuve Ouest, followed by a light reception. Poetry, song and musings are welcome.